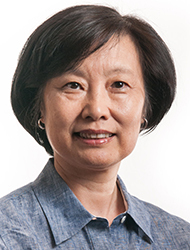 Dr. Ding is a clinical supervisor at Bastyr Center for Natural Health and a core faculty member in the Department of Acupuncture and East Asian Medicine at Bastyr University. She also maintains her own private practice in Seattle. Dr. Ding's clinical interests include pain management and stress relief, internal medicine disorders, autoimmune disorders, gynecological disorders, infertility and cancer treatment. Dr. Ding provides a Western-style medical assessment in combination with traditional Chinese medicine (TCM) diagnosis. She uses a holistic approach, treating with acupuncture, Chinese herbs and dietary suggestions. Dr. Ding has practiced acupuncture and Chinese herbs combined with Western Medicine since 1976. She taught TCM Fundamentals and TCM Diagnosis from 1980-1989 at Shanghai University of TCM and was also a general Internist at attached Hospitals of Shanghai University of TCM. She also worked as a registered nurse in neurosurgery and organ transplantation for eight years. Dr. Ding co-authored several books published in China on traditional Chinese medicine. She is frequently quoted in local and national media, such as The Seattle Times, Yoga Journal and CBS. She was named on of the “Top Doctors for Women” by Seattle Magazine in 2003 and has received the Faculty of the Year award at Bastyr University.